Lovers, to the left take a peek at Christian Louboutin’s mesmerizing Miss Fast Ankle Boots – the very same ones seen worn by Blake Lively, Alex Curran, and Jenna Dewan; now, if you’ll glance to the right, you shall find Nine West’s glamorous Gracious in Black Leather. Though the Nine West wonders lack the signature red leather sole of the Loubies, and sport a heel that is a full inch shorter than that of the 5 ¼” seen on the luscious Louboutin’s; for just $98.10, in comparison to the $995.00 needed to speed up your shoe collection with the addition of Miss Fast, they are an exemplary way to snag a little star style on a shoestring budget – and allow one enough spare change to add all five haute hues to their wardrobe (Black Leather, Taupe Leather, Black Suede, Red Suede, and Dark Grey Leather)! Oh, I think the Nine West would be much more practical. 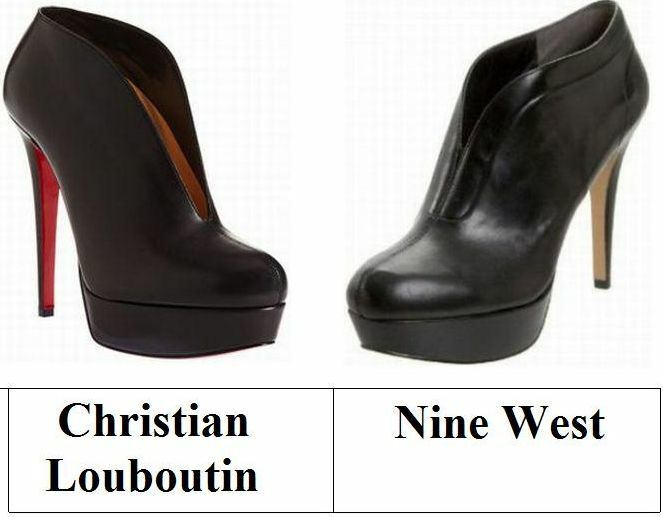 So glad to have the Nine West around! Such an exciting shoe you've got posted today. I so love the nine west! Christian Louboutin!! definitely. If I was planning to get this, I would have to save my pennies. Love those Louboutins. I'm not a snob,but I like the Louboutins. ahhhh! i wish that i could wear heels. my boyfriend is too short!!! No matter what, if I can afford Louboutins, I am getting them. I would choose the Louboutins because they're simply Louboutins. I love the way they look, but it's the red soles that are driving me crazy. I adore the Louboutins -- a much more streamlined look -- but the Nine West ones aren't a bad option! Oh my gosh, my choice is made !! great post ! great find, but i'd still have to go for the louboutins! Can't go against the Louboutin's. I'm afraid I'd get hit by a lightning bolt or something! I'm just curious what we extra for the extra $887 spent?? Such a cute style...I'll totally go cheap though! I just love the design! I'm thinking the cheaper one might be my only possibility of having these shoes. Those Louboutins look so classic. I need them in my wardrobe. so glad nine west has a version of these shoes now because they are totally amazing, and now quite affordable. I cannot get over how you keep finding items for your tight-wad roundup! I would definitely have to go with the Nine West pair, though. Wish I could afford the Louboutins, but the pair from Nine West is a great find! They are very similar and I always love the cheaper price...but I think the Louboutins look a little more chic. But I would no way pay that for a shoe! :) To each their own! I scrolled through your blog, and I love these posts with less expensive versions of designer items! Both of these shoes are gorgeous. The Louboutins are stunning, of course. But the Nine West ones are a good compromise! They're so edgy!